Whenever weak-willed coroners dither over the importance of names at inquests, they should be made to read stories like the one on the front of the Hull Daily Mail on Wednesday 2 April. 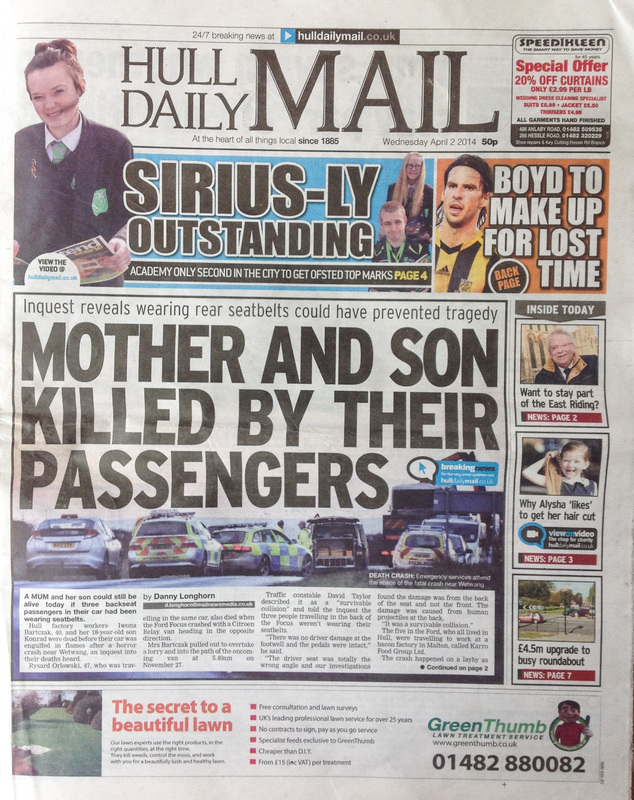 ‘MOTHER AND SON KILLED BY THEIR PASSENGERS’ was the candid headline, with the subheading explaining: ‘Inquest reveals wearing rear seatbelts could have prevented tragedy’. The detail involved three back seat passengers who were not wearing seatbelts when the Ford Focus they were travelling in was in a head-on crash near Wetwang last November. A police report said “it was a survivable collision” but that “the damage was caused from human projectiles at the back”, leading the coroner to record that the three back seat passengers “caused some of the fatal injuries from which the [two] front seat passengers died”. 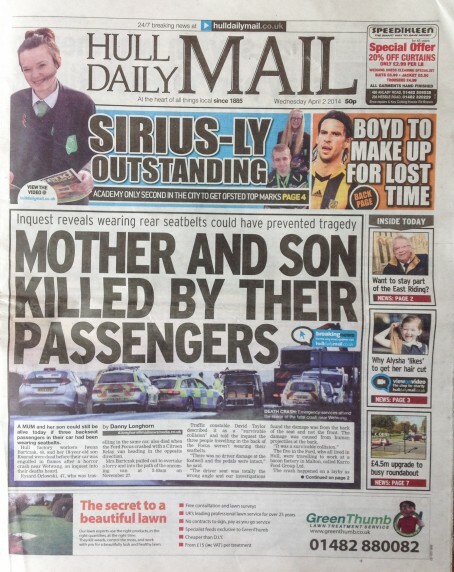 This was chilling stuff, but the fact that the names, relations and home towns of those who died and were injured came out at the inquest made it a definite splash – and therefore more noticeable by readers who might be reminded to make sure life-saving seatbelts are worn. Iwona Bartczak, aged 40, was driving and her son, Konrad, 18, was in the front passenger seat; they both died along with back seat passenger Rysard Orlowski, 47; the two other back seat passengers – Maksym Lebiest and Damien Zienski – were seriously injured; all lived in Hull and were workers at a bacon factory in Malton. Without those public interest details, the story would have been anonymous, less interesting and probably relegated to an inside page; and without local newspapers like the Hull Daily Mail investing in reporters at inquests, the story might never have been told. ‘Travel agent accused of £100k fraud claims denies one offence’ leading page 19, reporting the Hull Crown Court trial of Belinda Traves, of Pool-in-Wharfdale. These were just four of 20-odd court stories in that day’s paper, including an eye-catching column of convictions shorts that each began with the culprit’s name – a great example of open justice. Editor Neil Hodgkinson and his staff should be praised for their commitment to traditional court reporting, and for the overall story count: 200-plus stories on 39 news and features pages, and 87 reports on 14 sports pages, in a 72-page paper. I was also impressed to see an ‘InShort’ précis paragraph of every single news lead: more work for staff, but a bonus for readers in a rush, and good practice for online rewrites and tweeting. The Hull Daily Mail, with a cover price of 50p, sold an average of 36,028 copies a day in the second half of 2013, down -7.7pc on the same period in 2012. This is the highest sale of all daily regionals in Yorkshire and Lancashire – beating both titles in Leeds, as well as those in Sheffield, Preston, Bolton and Blackburn. And the average number of unique daily browsers on www.hulldailymail.co.uk was 46,784 in the same period, more than 40pc up from 32,072 in its ‘thisishull’ website days in the second half of 2012. While I applaud the Hull Daily Mail’s efforts, they are not alone in doing this. Others deserve credit too. Weekly regional newspapers are also constantly covering courts and inquests with fewer staff than the dailies.